One important risk to manage with regard to coal stacks is preventing fires due to spontaneous combustion. Generally, coal stacks are located in expansive areas where the wind blows unobstructed, posing a constant risk of spontaneous combustion. Even the best contingency plans by independent fire-fighting teams are unable to address the cause of the problem. And once fires start, if they aren't extinguished quickly they can spread rapidly and result in overwhelming damage to the company. Many companies set up regular patrols by engineers as a fire prevention measure. However, measuring coal stack temperatures can be dangerous, and it takes a lot of time and effort to cover the extensive areas involved. By using Yokogawa Electric's "Plant-wide field wireless," you can safely acquire temperature data any time from any point in a vast coal stack as a fire prevention solution. Plant-Wide Field Wireless is a wireless system that employs the international ISA100 Wireless (IEC62734) industrial standard, giving it the reliability demanded of industrial wireless communication and real-time functionality. It utilizes a redundant "Duocast" technology that communicates with two Access Points simultaneously to maintain connection when a communication channel or Access Point fails. It is highly scalable, supports a variety of interfaces for connecting to the Access Points and upstream systems including Ethernet, wireless LAN, and optical Ethernet, and is flexible during structural changes, making it ideal for building large scale wireless networks. Portable thermocouples of approximately 2 m in length are embedded at measuring points on the coal mounds where ignition is most likely to occur. By connecting these to YTA510 Wireless Temperature Transmitters, temperature data from 2 meters in depth can be transmitted wirelessly. Because it's a wireless system, it easily conforms to changes in the shape of the coal stack. It has a maximum range of 500 m, and covers up to 500 measuring points. 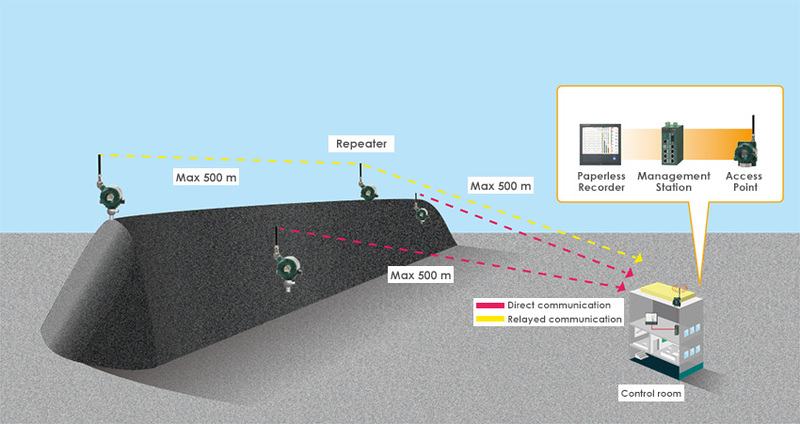 By installing repeaters, you can monitor from a control room that is up to 2 km away. This scale of regular fixed-point observation would not be realistic with wired solutions. Unmanned operation means that engineers are freed up from dangerous coal stack temperature measurement work. Further, the transmitters are battery powered (lasting up to 10 years depending on operating conditions), and require almost no maintenance. You can expect to lower your costs because you can reduce the time and labor involved in surveying immense coal stacks. Wired solutions require installation with cabling, which costs time and money. But wireless is relatively inexpensive because you simply install a device at each measurement and relay point. Installing the system can take as little as a day, saving even more time. We carry a broad lineup of wireless field devices. For the YT510 Wireless Temperature Transmitter, in addition to the 2-input model, we also carry the YTMX580 Multi-Input Temperature Transmitter that accepts up to 8 inputs per unit. With Yokogawa Electric solutions, you can connect to a variety of upstream systems, from small- to large-scale.